The menu in your shop is like a directory to different departments in your store. The well-structured information in your store can influence how well your site is indexed by search engines. That’s why it’s quite important to structure all the pages in your store and information in a way a customer likes it and comes back to your store. Nowadays there is a lot of useful and original navigation tips for your store. A great place among navigation belongs to CMS page where you can find information about what is better for admin to do to effectively organize the pages in your store. That’s why we created an extension “CMS Page Hierarchy” that will definitely help an admin to create an understandable guide for your products or a blog made of regular CMS pages. 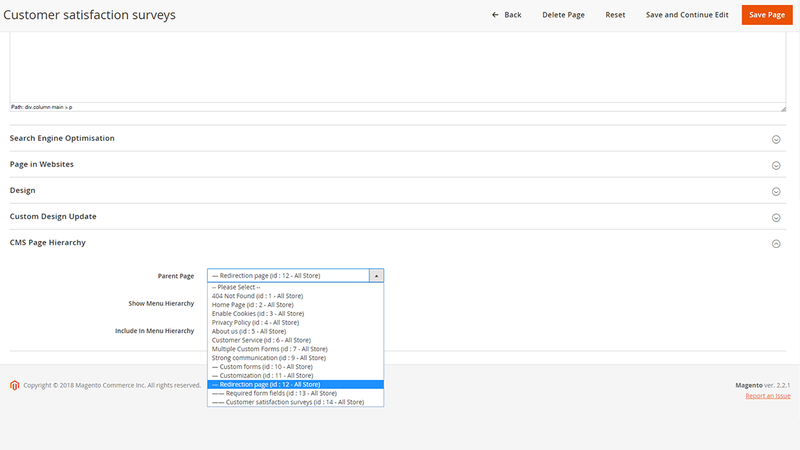 Now CMS pages can be put in a tree structure making a navigation process in your store simpler. An admin just needs to create CMS pages and with the help of our extension to create access to navigation tree layout that will be displayed in the frontend. The CMS Page Hierarchy extension from now on makes the process of navigation in a simple and easy way. Now adding page navigation to the store is not a difficult task anymore for the store owner. The extension has a similar principle of leveling in the way it is used in “Categories”. Our extension CMS Page Hierarchy easily helps to display information pages in the store in a hierarchy and meaningful structure. 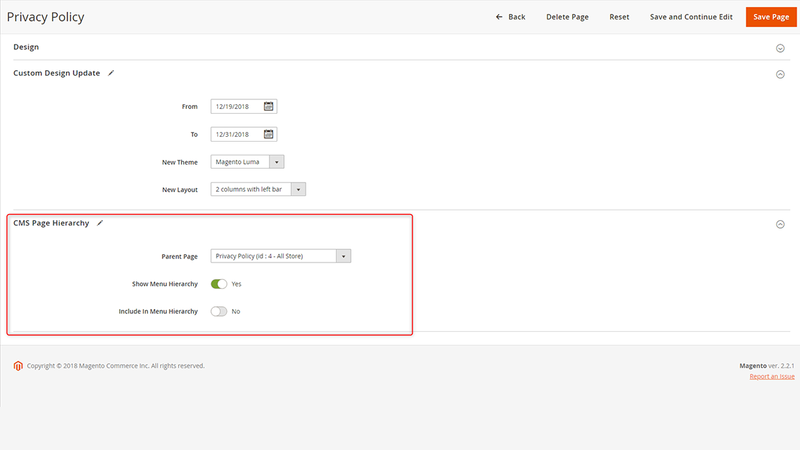 This function is a great way to manage, organize and display CMS pages in Magento. Now it’s easy to show the CMS pages with all relations and specify the layout of these pages. This extension is a great tool that will manage the CMS pages in a hierarchy very quickly and easily. 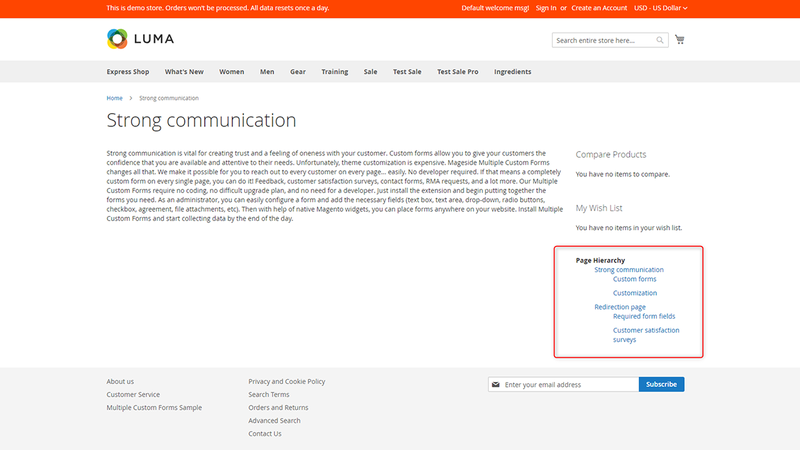 The process of managing the CMS pages is so easy now so you can add extra useful content to your store. Tree component will be needed anytime it is required to navigate through multiple layers of information and places where the information hierarchy needs to be shown to the user. 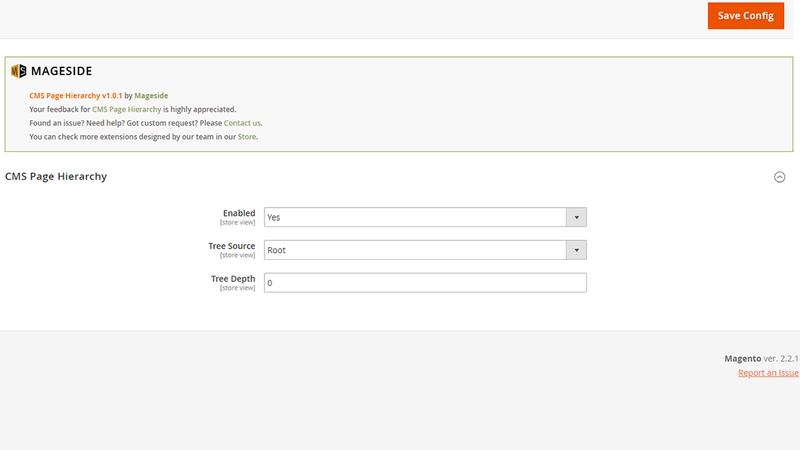 So an admin can manage the pages as a tree structure that will be shown to the user. 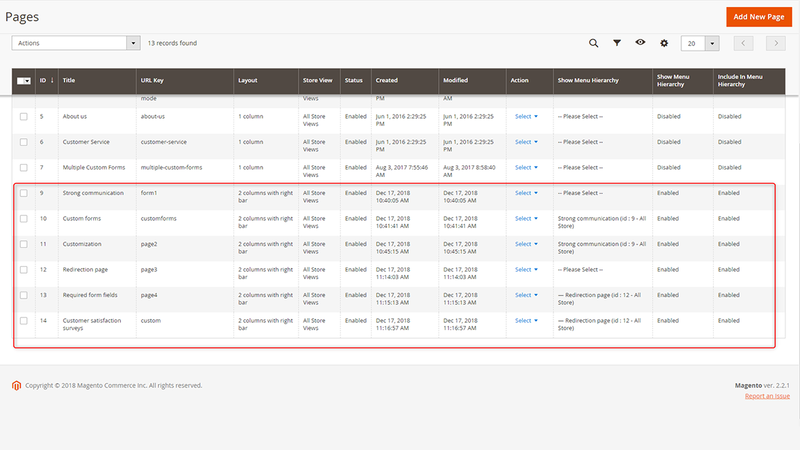 In the configuration panel, an admin can specify the tree source: root, children, and siblings. An admin can specify the tree depth for the pages just writing a number in the configuration panel. 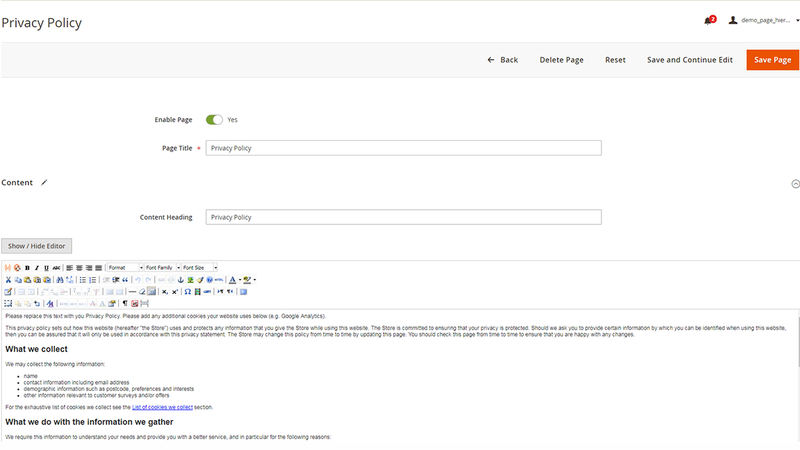 While creating the new pages an admin can show menu hierarchy of pages and include it in menu hierarchy on the frontend. 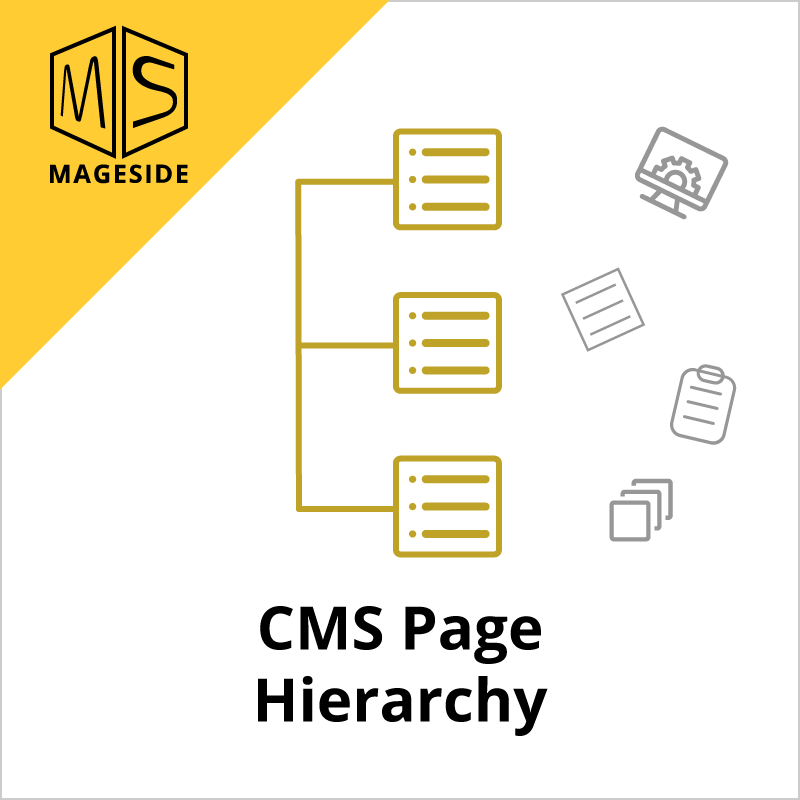 With the help of CMS Page Hierarchy extension, an admin can specify the layout of CMS pages with all relations. Whether it is 1 column or 2 columns with left bar, it’s up to admin what layout to choose.